Designed for gamers, creative professionals, and PC enthusiasts who are seeking higher performance without upgrading their mobile or console system to an SSD, the 1TB FireCuda 2.5" Internal Hybrid Drive from Seagate combines a 1TB storage capacity with a solid-state cache. While the solid-state cache isn't user accessible, copies of the most frequently used data are kept there, improving overall performance. The FireCuda is equipped with a SATA III 6 Gb/s interface, a 2.5" / 7mm form factor, and data transfer rates of up to 140 MB/s. This drive also features high levels of reliability, with 1 non-recoverable read error per 1014 bits read and 600,000 load/unload cycles. Seagate's FireCuda is protected by a limited 5-year warranty. 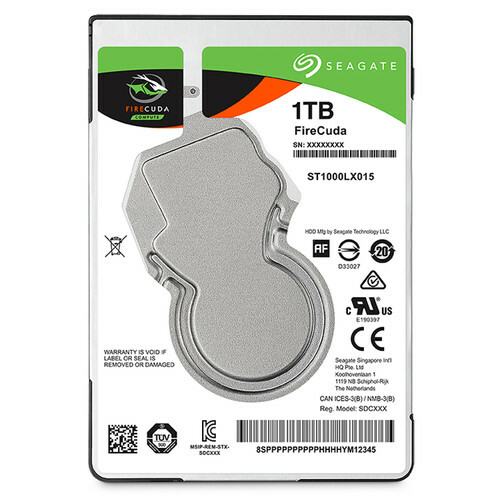 The FireCuda has a storage capacity of 1TB and provides improved performance for users whose system has a 2.5" / 7mm drive bay. Green Hybrid technology reduces device power consumption, helping users extend their drive's life and keep their costs down with a power efficient drive. Multi-Tier Caching Technology helps enhance performance by using NAND flash, DRAM, and media caching technologies, enabling users to load applications and files faster. Adaptive Memory technology identifies frequently accessed data, thereby providing the data faster, consuming less power, and extending drive life. Box Dimensions (LxWxH) 6.3 x 4.8 x 1.9"
1TB FireCuda 2.5" Internal Hybrid Drive is rated 4.0 out of 5 by 1. Is it 7200 or 5400 RPMs? It is 5400 RPM. But as it is a Hybrid drive, it has decent speed. I run a couple of Virtual Machines off of it and the performance is good.